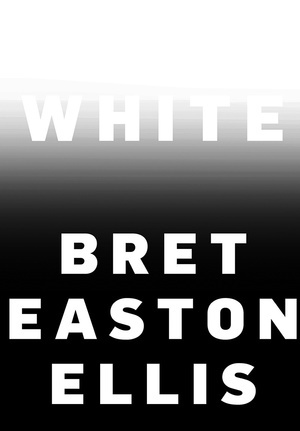 Let's pretend for a moment that Bret Easton Ellis is capable of such a staggering feat of truth-telling, and read White as if it is indeed a work of nonfiction. As far as I'm concerned, Bret Easton Ellis has been dead since 2010. That was the year he last launched a book, Imperial Bedrooms (Knopf, 2010) to the delight of almost no one. Let's not slog through an epic rehashing of his previous six novels, which critics and citizens alike tend to trash and venerate with equal fervor. Ellis is literary cilantro; he is mightily polarizing. Had I stayed in grad school another few years, I'd have dissertated on him. It's fair to say that I'm a fan of his books, and also fair to say that these books collectively, easily rank as number one on my personal list of problematic favorites. Since 2010, Ellis has stuck to screenwriting and podcasting in between bouts of viral tweeting. I haven't paid attention to anything he has done in the past ten years because I always felt that Ellis was best on the page. So when Penguin Random House announced the publication of White, I immediately called dibs on the review. You don't have to believe him though. That's the ultimate question threading through each of his books: why should you believe any of this? He's taken so much heat for various offenses against decency and good taste over his writing career, and also offered bizarre laurels by some total whack jobs. What his lovers and haters truly have in common is that they fell for it—for the idea that one should take Bret Easton Ellis seriously. And judging by the early reviews of White, I'm concerned that this overwhelmingly misguided instinct to literalize him is happening again with even more awful results. Let me say again, the whole secret of why I'm able to love this author's work: I don't take Ellis seriously. Penguin Random House says that White is his "first work of nonfiction." Haha, okay, sure it is. Let's pretend for a moment that Ellis is capable of such a staggering feat of truth-telling. Let's take him seriously at his word and read White as if it is indeed a work of nonfiction. Most of it is Ellis whining about how the outrages of our collective life on the internet bother him. The main argument of the book is that conflicting opinions are not good cause for ostracizing people. He says he's always just been honest, that he has mixed political opinions and didn't vote in the 2016 presidential election, and that it hurts him to see how people mistreat each other in tweets. There's even a rant about the problem of leftist identity politics being the real slippery slope to fascism these days, and some belated odes to Charlie Sheen and Kanye West. Ugh, what a basic white guy Ellis turns out to be. What a whining, hypocritical, bloated sack of it's-my-fault-but-not-my-problem this guy exhibits. What a do-nothing, rich jackass Ellis is. To read White in all its alleged seriousness is to become instantly and also repeatedly inflamed by the author's very unamusing and privileged putdowns of what little shred of dignity our public discourse has left. His middle name still appears to be Controversial, not Easton. And every couple of minutes, he's asking again: What are you getting so mad about? He's just giving his opinions, after all. If you get mad, you're proving his point, which will definitely not deescalate your hostility. If you take Ellis seriously, there's basically no way to like him at a human level. You will not want him at your dinner party. And he does kind of enjoy getting invited to dinner parties. This is because he is happy to separate art he loves from the artist who made it. So now Hollywood knows who it can put on the seating chart next to the very many assholes trying to make a quiet comeback too soon on the heels of their #MeToo moments. Over and over again in White, Ellis emphasizes the importance of examining his books aesthetically, rather than relying on them to provide a sense of their author as a human being. Obviously, this is a weird claim for him to make in and about a nonfiction book. To take a nonfiction book seriously is to presume that the author is authentically inserted into the bulk of the text. Yet Ellis has always inserted himself into his fiction. We know that many facets of Patrick Bateman are just reflections of the author. Ellis even went so far as to classify Lunar Park (Knopf, 2005) as autofiction, or a noir memoir. It's no stretch whatsoever to flip that and ask the aesthetic question he told us to: how is Ellis novelizing his nonfiction book? You may have noticed that nonfiction book sales are through the roof in this decade. People are addicted to the authenticity sauce. This notion of honesty is ripe for satirical treatment, and satire is what Ellis unarguably does best. So, here's my final verdict: White is a satire of nonfiction writing, and it should not be considered a serious work. You may think that I'm doing Ellis a very big favor here. Dismissing every ugly thing he says as a work of "just fiction" ultimately lets him off the hook for each uninformed, lazy, brutally bad idea he spouts in White. And you're right. We need definitive clues that the author's awfulness has been on purpose. We need some evidence to suggest that Ellis is being deliberate in his construction of a satirical nonfiction book, and there is indeed plenty of it. "Rather than respect and niceness, inclusion and safety, likability and decency, my goal was to be confronted by things. […] I craved being shaken. I loved ambiguity. I wanted to change my mind, about one thing and another, virtually anything, I wanted to get upset and even be damaged by art. I wanted to get wiped out by the cruelty of someone's vision of the world" (125). "I think life is essentially hard, an existential struggle for everyone to varying degrees, and that scalding humor and rallying against life's built-in absurdities and breaking conventions and misbehaving and encouraging whatever taboo is the most honest path on which to move through the world. Sometimes that means making fun of myself or lashing out in a way that might make dumb asses or the merely misinformed think that I hate myself" (108-9). "Outrage gets attention, outrage gets clicks, outrage can make your voice heard above the deafening din of voices squalling over one another in this nightmarish new culture—and the outrage is often tied to a lunacy demanding human perfection, spotless citizens, clean and likable comrades, and requiring thousands of apologies daily. Advocating while creating your own drama and your brand is where the game is now. And if you don't follow the new corporate rules accordingly you are banished, exiled, erased from history" (173). "brash, a gangster, his own man whether you liked him or loathed him, a loner, transparent, a truth teller not to be taken literally, flawed, contradictory, a rebel, awful for some or wonderful for others but certainly not vanilla or middle-of-the-road, incapable as a bureaucrat but skillful as a disruptor" (251). "Kanye, like everyone else, on both sides of the divide, now envisioned the world as a theater where a musical was always playing, and hopefully starring someone like themselves voicing their own opinions. But in Kanye's case with the appropriate amount of narcissistic dragon energy, a power that allowed him, no matter what others thought, to be totally free" (261). Well well! Good luck to Ellis with this dream of being totally free, which is bound to fail when people read White as if it's a serious nonfiction book. If you read it as a novel, it's pretty fun to hate the protagonist, who is basically an updated version of American Psycho's Patrick Bateman fit for the selfie generation (Vintage, 1991). White has some very beautiful digressions, just as in American Psycho, such as the allure of actor Richard Gere and the power of body horror movies. I almost forgot how lovable and articulate Bateman can be at times when he's not murdering. Unreliable narrators are this man's bread and butter; call it whatever genre you think will sell the most copies. Hey, if we call it nonfiction, it's his first nonfiction. How epic and exciting! When all is said and done, I expect White will be just as misunderstood as all the author's other work. He says he's fine with that outcome—which is the primary reason I very much doubt he's fine with that outcome. Let's consider one time that Ellis recounts as an early clue to the mission of White, what happened when journalist and editor Tina Brown commissioned him to write a profile of Judd Nelson for Vanity Fair. He ended up doing a round-up of Los Angeles hot spots, which was great. But then he added a bunch of super lame spots just for a goof, just to unsettle and thwart the seriousness of the article and its corporate overlords. Some people believed the satire and actually turned those dives into hot spots for a short while, which was funny and kind of nice. But also, Brown never offered Ellis a gig again. She wanted nonfiction and burned him for splitting the difference between what you expect from a serious piece of fact and, um, I guess his urge to be "totally free". Expensive! "I often considered David the most overrated writer of our generation, as well as the most pretentious and tortured, and tweeted as much that night along with other things that bothered me, including how the culture has reinterpreted him and how naive I thought David was to believe he could control this. The sincerity and the earnestness he began trafficking in seemed to some of us a ploy, a kind of contradiction—not totally fake, but not totally real either, a kind of performance art in which he'd sensed the societal shift toward earnestness and accommodated himself to it. But I still liked the idea of David and the fact that he existed, and I also think he was a genius. While my feelings about him were—yes—contradictory, they were also honest" (178).